December 28, 1956 remains a red letter day in the cinematic history of Sri Lanka (formerly Ceylon). The maiden feature film of 37-year-old director Lester James Peries premiered at the upmarket ‘Regal’ theatre in Colombo on that day. It was a black and white Sinhala film named ‘Rekava.’ Though Rekava is spelt in English with both a ‘V’ as well as a ‘W,’ I am sticking to ‘V’ because the original title shown in the film spelled it that way. The film’s Sinhala title Rekava was translated into English as the ‘Line of Destiny’ when it was screened at the prestigious ‘Festival De Cannes’ in 1957. It was most appropriate as Rekava was a landmark achievement that altered the destiny of Sinhala cinema. This column intends focusing on the film to mark the 60th anniversary of Rekava’s first screening on that fateful day. Most of the facts that I rely upon on this narrative are from the horse’s mouth itself via interviews given by Lester James Peries appearing in different books and journals. I, myself, have utilised these in some of my earlier writings and would now do the same for this article. Regi and Mervyn and many others who praised Rekava were impressed by the fact that the film dispensed with the melodramatic hallmarks prevalent in Sinhala movies since the pioneering ‘Kadawuna Porunthuwa’ or Broken Promise made in 1947. The making of Sinhala films was heavily influenced by Hindi and Tamil films made in India which were derisively described as ‘Masala movies’ or ‘formula films.’ Rekava was, in that sense, a departure which contrasted sharply with the usual Sinhala films. Rekava belonged to the realist cinema category. The actors and actresses in Rekava appeared on screen as real people whom one meets daily. They spoke simply and in a natural way, without stylised diction or expansive gestures. There were many shots where they did not speak at all with their expressions conveying emotions through the eloquence of silence. The greater part of the story was related not by words and songs alone but to a very great extent by a number of images and scenes with minimal dialogue. Another remarkable aspect of Rekava was that it was shot entirely on location outside a studio. Until then, movies were mostly filmed in studios in India and Sri Lanka, in artificially-constructed sets. Also, a few of the filmy stories took place in a rural area. Lester changed all that by basing the film’s tale in a rural village. More importantly, he filmed the village-based story in real village surroundings with cameraman Willie Blake. Most outdoor scenes in Rekava were shot in natural light. With the advent of Rekava in 1956, newcomer Lester James Peries made his mark. Subsequently, with other masterpieces like ‘Gamperaliya’ (Village upheaval) and ‘Nidhanaya’ (The treasure), Lester has become a national icon identified with the sphere of Sri Lankan cinema over the years. 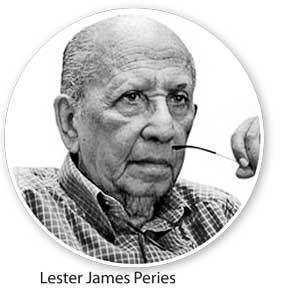 Lester James Peries is acknowledgedly the pioneer of authentic Sinhala cinema. It was he who created in every sense of the term an indigenous cinema in both substance and style. It was also he who first gained worldwide recognition for Sinhala cinema. In a film-making career spanning more than five decades, Lester has made 20 feature films inclusive of ‘Pinhamy’ in 1980. His final feature was ‘Amma Waruney’ or an Elegy to a mother (released in 2006). Lester has also made eleven short films - most of them in documentary mode. The first of them was ‘Soliloquy’ made in 1949 and the last ‘Kandy Perahera’ filmed in 1973. The greatness of Lester James Peries however cannot be measured by the quantity of his output. It is the qualitative nature of his films that elevated him to commendable heights. Lester James Peries was born on April 5, 1919 in Dehiwela to Catholic parents from an affluent westernised background. His parents wanted him to become a lawyer or doctor while his teachers wanted him to be a Catholic priest. Lester however wanted to study literature and began writing stories, poems and plays from his student days. He was also an incurable film buff. Lester dropped out of school at the age of seventeen and became a journalist. He worked at the Daily News and later at Times of Ceylon. Lester also reviewed books for Radio Ceylon. It was then that he began dabbling in drama by joining the theatre group ‘Drama circle.’ It is said that the legendary Lionel Wendt realised Lester’s creative potential and advised his parents to allow him to do whatever he wanted. Lester went to London in 1947 to join his brother Ivan, a reputed painter. The brothers lived together for some years and apparently led a bohemian way of life. Lester wrote a column from Britain for the Times of Ceylon in Colombo, then edited by Frank Moraes (it was titled ‘Letters on the Arts from England’). While working as correspondent of Times of Ceylon, Lester also engaged himself in making short films and documentaries. Short film ‘Soliloquy,’ made in 1949, won an award for artistic and technical merit from the Institute of Amateur and Research Filmmakers of Great Britain in 1951. He also produced another award winner ‘Farewell to Childhood.’ It was based on a short story he had written when in Sri Lanka but on film he adapted it to English surroundings. It was the eminent documentary filmmaker Ralph Keene who was instrumental in persuading Lester to return home. “You should make films in your own country, about your own people,” Ralph told him. Keene himself went to Colombo and invited Lester to join him. After spending several years in London working as a journalist for the ‘Times,’ Lester returned home and began work at the Government film Unit (GFU) for one-fourth the salary he got in Britain. However, four years at GFU dampened his spirits as Lester felt rather stultified, presumably due to internal politics in office. Besides, the creative impulse in him wanted to make a fictional feature film. There was also this growing disdain for the melodramatic Sinhala films being churned out and the idealistic ambition of making a realistic Sinhala film. It was at this juncture that destiny played a hand in the form of kinsman Christopher Peries, a successful businessman. Christopher made Lester an offer he could not refuse. Lester was told that a group of entrepreneurs and professionals wanted to form a company and produce a Sinhala feature film. Lester was requested to quit GFU and come on board where he would be given a free hand. Lester would produce and direct the film. The script was to be of his choice. He could select the cast and crew. The company would purchase state of the art equipment. It was also guaranteed that the company would produce at least two films. Lester James Peries mulled over it and decided to grasp the offer. This was the opportunity he was waiting for. Two of his colleagues also opted to quit GFU and team up with Lester. One was the cinematographer William (Willie) Blake, and the other Editor Titus de Silva who was later known as Titus Thotawatte. The trio embarked on the challenging venture fired by the vision of making an authentic and realistic Sinhala film. The production company was duly formed and named Chitra Lanka. The Chairman was wealthy tycoon Sarath Wijesinghe (uncle of Upali Wijewardene). Besides Christopher Peries, the others on the Board of Directors were eminent Lawyers George Chitty QC, H.W. Jayawardene QC (the younger brother of J.R. Jayawardene), cartoonist Aubrey Collette and Douglas Fernando (an insurance entrepreneur). The only hitch was that the initial offer of making two films had been downsized to one. It was stipulated that the second would be made if the first was a success. The company got down to work. Several potential stories and scripts were perused including a synopsis of the historical novel ‘Rohini’ by Martin Wickremasinghe. Lester however resolved that his venture would have a contemporary theme set in a rural environment. Three film factors deeply influenced and motivated Lester in this yearning to make a realistic film amidst a rural setting. Firstly there was the semi-fictional documentary ‘Nelungama’ made by Lester’s boss at the GFU Ralph Keene. Lester had co-written the script and the dialogues for it. While filming, Lester was exposed to village life and longed to make a film in a rural environment. Secondly was the impact of Italian neo-realistic cinema, particularly the films of Vittorio de Sica, Luchino Visconti and Roberto Rossellini. Thirdly was the film ‘Do Bigha Zameen’ (Two acres of land) by Indian Director Bimal Roy that brought rural life to the screen in a realistic manner. Interestingly, Lester was not influenced by his great Indian contemporary Satyajit Ray when he made Rekava. Actually Lester had not seen Ray’s pioneering ‘Pather Panchali’ at the time he made Rekava. India’s greatest filmmaker Satyajit Ray had burst upon the global film scene before Lester James Peries. Ray’s ‘Pather Panchali’ was made in 1955 and ‘Aparajito’ in 1956. Since Lester’s Rekava was released in late 1956, many reviewers wrongly assumed that Ray had inspired Peries. Satyajit Ray himself considered Lester to be of the same mould as him and once referred to the Sri Lankan director as his “closest relative East of the Suez.” In spite of the creative affinity between the two, Peries was not influenced by Ray when he made his first film. Regi Siriwardena once told me in an interview that Lester had not seen Pathar Panchali or Aparajito when he first made Rekava. Regi, who has worked as scriptwriter with Peries on some films, told this writer that the first Ray film viewed by Lester was Aparajito and that too was only after Rekava was made. “It is a classic instance of two great Asian directors being of the same creative wavelength and proceeding on a parallel course independent of each other,” Siriwardena said. After much pondering, Lester decided he himself must write the story and script for his first feature and not rely on an outside contributor. He wrote the story which was a simple narrative tinged with elements of a fairytale or fable. Lester wrote the script himself, aided by K.A.W. Perera who later became a successful director in his own right making films like ‘Kapatikama,’ ‘Lasanda’ and ‘Bicycle Hora.’ There was however much improvisation as shooting went on with new lines and words of colloquial usage being introduced. Veteran actor D.R. Nanayakkara helped to add colloquial words in vogue. The cast for Rekava was handpicked by Lester. When Lester was living in Moratuwa, near the Lunawa lagoon, he had a black Morris Minor. There used to be a little boy from the neighbourhood who used to come and stare wide-eyed at the car. Lester then used to think that the boy with expressive eyes would look good in a film. So when Rekava began, it was that boy Somapala Dharmapriya who was picked to play Sena. “Somapala had large, dark eyes filled with the wonder of childhood,” observes Lester. The girl Anula was played by Myrtle Fernando. She had already acted in the Sinhala film ‘Ahankara Sthriya.’ The boy was a fresher. The children were given their dialogues, and rehearsals were done for about two weeks in a classroom at Lester’s Alma Mater St. Peter’s College, Bambalapitiya. However, the boy found it difficult to memorise the lines while rehearsing, but proved to be a natural actor in front of the camera. Lester’s way of directing children was different. Instead of imposing anything, he would leave it to the kids themselves to act as they wished, intervening to correct only when absolutely necessary. The role of the mother Kathrina was acted by Iranganie Serasinghe nee Meedeniya. Her husband in the film Kumetheris was played by her spouse in real life Winston Serasinghe. As is well-known, both Iranganie and Winston were from the elite English theatre, though they have acted in many Sinhala films. Sinhala stage actors of the time like D.R. Nanayakkara, N.R. Dias and Romulus de Silva played the parts of Sooty, Podi Mahathaya and the village headman respectively. The versatile Sesha Palihakkara acted as Miguel, the stilt-walker. The young couple Premawathie and Nimal was played by Mallika Pilapitiya and Ananda Weerakoon who did not act in films afterwards. Sadly, the kids playing Sena and Anula are no more as they both died of cancer sometime later. In keeping with the assurances given to Lester, the company did let him purchase modern equipment. While in London, Lester had seen Carol Reed use the new Arriflex camera for location shooting in his film ‘A kid for two farthings.’ So Lester procured the blimped, 400ft magazine Arriflex model from Germany. This was the first such camera to be used anywhere in Asia at that time. Lester also bought an RCA Kinevox magnetic sound recorder from the USA. This was the second of its kind to be used in Sri Lanka; the first was used by the GFU. Thus began the shooting of Rekava on location. There were two locations for the film, one in the hill country at Bandarawela and the other in the low country at Wewala. Since this was Lester’s first attempt in making a feature and because the concept of location shooting was something novel, the film-making became a trial and error exercise. The experience of making the path breaking film, its release and aftermath would be related in a forthcoming article.